This week marked the annual trip barley growers from around America make to our nation’s capital. The annual event is a great opportunity for growers to meet their representatives in the U.S. House and Senate, and for those growers to advocate for policy priorities that help ensure the viability of American barley farming for generations to come. In August 2017, I had the honor of visiting Skookumchuck Agriculture, in Sunburst, Montana. Lyle, who owns the business, is a family farmer, and grows barley and lentils, among other crops. Lyle’s family comes together to work during the harvest, and he hires law enforcement and military veterans to help. I spent the days working the combines (to the extent a city boy can) and learning about the impact that policy made in Washington, D.C., has on Lyle’s farm. It was particularly dry in 2017, causing catastrophic fires across much of the West. So as you can imagine, we talked about how crop insurance is essential to the viability of farms like Lyle’s. Back in Washington, the Beer Institute (BI) worked hand-in-hand with the National Barley Growers Association (NBGA) to advance important policies in last year’s farm bill. For example, the BI and NBGA were instrumental in farm bill conference negotiations, successfully advocating for flexibility in crop insurance programs under the Agricultural Risk Protection Act (ARPA) of 2000. These products, created through a public-private partnership, have resulted in innovative ways to help farmers just like Lyle. On the research side, our coalition also successfully worked with the wheat growers to secure the reauthorization of the Wheat and Barley Scab Initiative in the farm bill, as well as a 50 percent increase in the authorization level to $15 million (from $10 million). 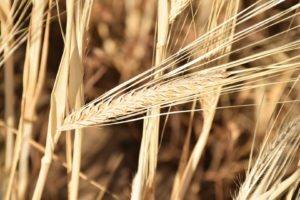 Scab, aka fusarium head blight, is one of the more serious diseases that can impact barley production, and so this was a very important win for industry and growers alike. But our work isn’t over. Now that the farm bill is finally signed into law, we need to ensure full implementation and funding of farm bill provisions. We’ll continue to work with barley growers to make sure their voices are heard in the chambers of the U.S. Capitol, so every member of Congress knows: No Barley, No Beer.